Today, repairs are much more complicated. Recently, a component in the guidance system on Schwarz’s John Deere 7230 tractor, which he uses to plant his crops, broke. Since the Moline, Ill.-based company no longer supports his tractor’s system, Schwarz is looking at a $3,000 bill for a used electrical part. He would like to just get his current component repaired, but manufacturers won’t provide independent shops with the guides or technology that would allow them to fix it, and Deere — one of the few tractor manufacturers with an authorized repair shop in south-central Nebraska — won’t repair older parts if it no longer supports them. Schwarz is far from alone. Once capable of fixing their mechanical workhorses in a barn or under the shade of a tree, many of the nation’s 3.2 million farmers are now faced with tractors that can only be fixed by a manufacturer — a situation that benefits manufacturers’ bottom lines but puts added burdens on often-struggling farmers. But Schwarz and other farmers are fighting back. They’re pushing “right-to-repair” legislation, which would require manufacturers to provide the same information and parts to farmers or independent repair shops as they do for the manufacturers’ repair shops. “We never doubted that it was going to be difficult, in a David-vs.-Goliath kind of way, to go up against some of the most iconic brands in the world,” said Gay Gordon-Byrne, executive director of The Repair Association, a coalition that works to promote right-to-repair legislation. 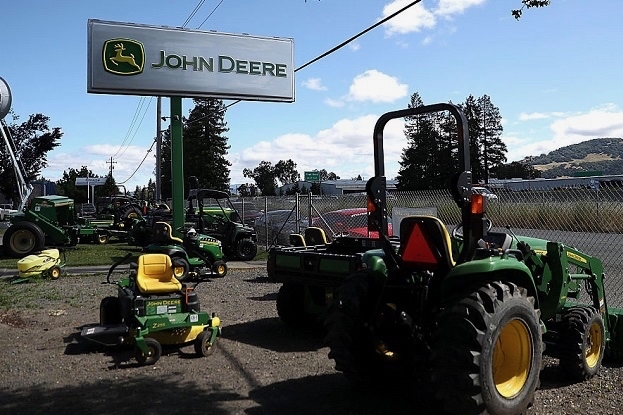 Deere and other equipment dealers have strong incentives to fight right-to-repair legislation. If farmers are forced to visit authorized dealers, it provides increased business for the manufacturers, and allows them to set the price for parts. Additionally, having only authorized shops able to repair machines means farmers are more likely to buy equipment from manufacturers with authorized shops nearby — which in most areas are the bigger companies such as Deere or Case IH. Meanwhile, Tom Schwarz, the Nebraska farmer, is saving his money so he can afford a new guidance component for his $120,000 tractor. Since Schwarz is an organic farmer who can’t use herbicides, the machine’s guidance system ensures that stray weeds can be removed without damaging his crops. In the meantime, he’s resigned to buying a $3,000 second-hand part from Deere — the only source for the component. Methodology:MapLight analyzed lobbying reports from New York, Massachusetts and Nebraska for 2015-2016 for client organizations that lobbied on right to repair legislation. Spending totals consist of amounts from reports indicating right to repair legislation was lobbied.